Announcing the death of ugly AM radio sound! Welcome to the world of AM high fidelity and meduci wideband AM stereo quality sound, day and night. The future of radio is now. Better reception. Better sound. At meduci, we are very passionate about good quality sound. meduci has AM stereo radios for sale. Many radio manufacturers are leading you, the consumer, to believe that AM radio sound is literally abysmal! Radio manufacturers have, by cutting corners and costs, tossed aside a medium that can sound as good as FM radio broadcasting, and reach a farther listening area. In many communities, an AM station is the only LOCAL live media! It deeply angers meduci that public perception of what AM "sounds" like should be garbage, when in actuality- its potential goes far beyond what most people have ever heard! We hope that when you hear a good AM stereo station proudly speaking about their "sound" that you realize it is your current RADIO product that limits the quality of what you hear, not the AM medium wave band itself! Our American economy is driven by purchases, and purchase price is certainly a determining factor. However, that DOES NOT mean that saving a few pennies here, or a dollar per unit there, to improve the quality of AM sound in radios, would break the manufacturer, or the consumer. This explains why we did not cut corners when designing and manufacturing our own AM stereo products. We have adopted Motorola's C-QuAM®™ analog stereo AM technology, and are proud to offer the latest integrated circuit decoder technology available for C-QuAM™ stereo tuners, to provide optimum and accurate AM stereo performance. We re-launched AM Stereo in October 2005, and we gave C-QuAM™ a second chance in the marketplace by introducing four new AM stereo products since then. These AM stereo products cannot be purchased anywhere else. Customers are very satisfied with their meduci tuners. Satisfaction is so high that meduci tuners are not re-sold on eBay. Each meduci product is also backed with one-year warranty against defects in material and workmanship. 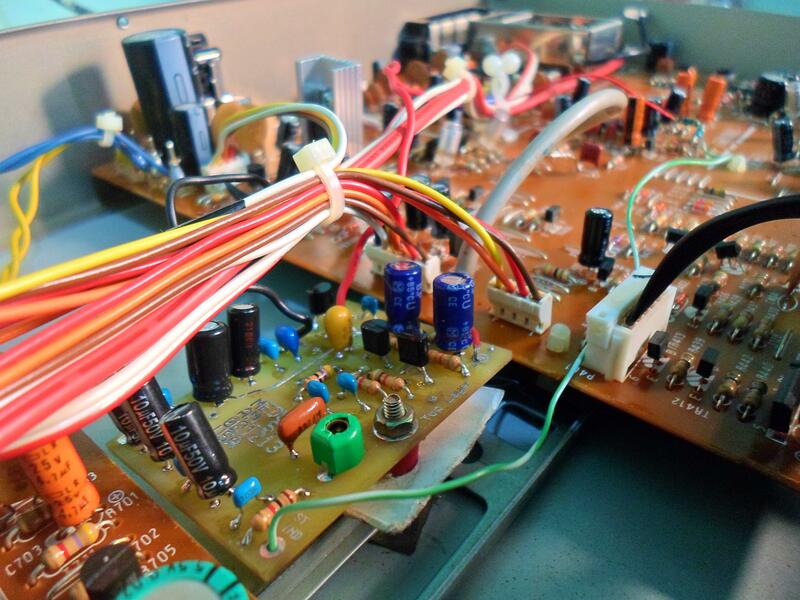 We use ORIGINAL McCoy Motorola IC chips and other prime components in every meduci AM STEREO product. There are many AM medium-wave stations broadcasting wideband full fidelity sound in different parts of the world. When received using an appropriate wide band high fidelity AM stereo receiver or tuner under good conditions in the reception environment, using a good external indoor tunable loop antenna, the recovered noise-free high definition sound is virtually indistinguishable from many high quality FM stereo broadcasts! Hearing is believing! Sample one of our high definition AM stereo products, and judge the enhanced audio fidelity for yourself. READY TO CONVERT YOUR OWN AM HIGH FIDELITY RECEIVER TO C-QuAM STEREO!! MEDUCI IS INSTALLED IN MORE AFTER MARKET TUNERS THAN ALL OTHER DECODERS COMBINED ! This high-quality and low-cost add-on after-market AM stereo decoder printed circuit board is assembled and tested (not a kit! ), and the circuitry is based upon the popular third-generation Motorola MC13028AD stereo decoder chip. For the do-it-yourself person, this 2.0 inch by 1.5 inch (50.8mm x 38.1mm) sized board will easily and economically convert your own tired sounding mono digital electronic tuned receiver (ETR) to stereo reception (where available) using the C-QuAM standard. This board accepts the signal from the Intermediate Frequency (I.F) of a receiver (450 or 455 kHz) and decodes stereo broadcasts. It operates at 10-15 Volts D.C and provides standard buffered and isolated line level left and right audio outputs, for direct connection to the receiver's audio amplifier. It may be used to support 30 Hertz to 15,000 Hertz audio frequency response; however, much of this will depend on the bandwidth of your receiver's I.F strip. Instructions are included for typical installation to receivers. BONUS: Forced Mono feature is included on-board. Schematic diagram and details are included with purchase. We also provide free technical guidance and installation instructions with every order! We want you to succeed. New price effective now: $28.00 USD each, to any PayPal confirmed shipping address virtually anywhere within the world, with zero additional cost for postage and handling to destinations inside the continental United States. Tuner/receiver is NOT included with your purchase. Please ensure prior to your purchase that there is adequate installation space inside your host receiver to be converted to AM stereo. There are six internal connections to be made to your receiver (+12-volt D.C power, ground, 450 or 455 kHz I.F input, stereo LED driver output, left channel audio output, and right channel audio output). If you wish to add forced mono switch, then seven connections are necessary. There is also an on-board small eight-volt linear-mode IC voltage regulator. Purchase details are located here>> meduci AM_ST C-QuAM DECODER CONVERTER ADD-ON BOARD. This is a stocked item, and is available for immediate shipment after your PayPal payment clears to our bank account (typically within three to five business days). This decoder is new, made-to-order, and is directly sold from the manufacturer. Assembled in the United States of America from U.S and globally-sourced parts. For AM Stereo Stand-Alone AM_ST Decoder Owner's Manual, please click on this link. McINTOSH MR7084 TUNER WAS CONVERTED TO AM STEREO RECEPTION USING MEDUCI AM_ST DECODER !! In this corner, we will spotlight current projects for our meduci AM_ST outboard decoder! Phil 'Tha Dood' from Poca, West Virginia USA purchased two meduci AM_ST decoders from eBay, knowing which products he wanted to be converted. One of the modifications was a rather high end deluxe McIntosh MR7084 tuner (domestic made in U.S.A). We reviewed the service manual that he provided, and we supported the modification, by providing the connection details from this host tuner to his AM_ST decoder. And the results? AM stereo broadcasts could be successfully received for the first time! "I think better than the FM stations on this tuner," Tha Dood says. "Amazing! Whatever fidelity that transmitter is capable of, this tuner now hears it." Tha Dood has his own medium wave carrier-current station at 610 kHz, with FCC part-15 compliant radiating station at 1620 kHz, and a low-power unlicensed AM Stereo test transmitter from Sean Cuthbert operating on 1580 kHz. He also operates a web site called Real Free Radio where his music play list can be found. His current activities are also dicussed. Much of the stock tuner was retained. One capacitor (C93) was removed, that came from pin 12 of IC2 (AM tuner IC chip), to IC5 (FM MPX stereo decoder IC chip), to disable the monaural AM audio output path. Series resistors were added from the AM_ST decoder left and right audio outputs to the tuner's audio amplifier. Switched B+ D.C voltage from the AM tuner IC chip was also a convenient source to power the AM_ST decoder. This ensured that the AM_ST decoder was powered down when tuner was switched to FM band. Therefore, any stray audio would not be present from the AM_ST decoder to leak through when tuning FM stations. Front panel MPX LED stereo indicator was also able to be used, and was a simple connection to the board. This McIntosh tuner had one stock blue muRata SFG450D ceramic filter after the tuner's mixer stage, which was capable of 10kHz audio response. Tha Dood was able to remove that SFG450D filter, and replace it with one new black muRata CFU450B ceramic filter that was included with his AM_ST decoder purchase. It was a direct drop-in replacement. McIntosh also made accommodation on their tuner board for a five-pin ceramic filter, and the two empty holes on the board were used as I.F output to the AM_ST decoder. Tha Dood is going to button up the modification. He says, "I hope to mount the meduci board, and I believe that I've finally found a decent place to do that, just between the Tuner Board and faceplate board is a dummy foot hole, with a plastic plug in it." As the pictures show, this was a very successful AM stereo conversion modification project. SONY STR-DE525 RECEIVER WAS CONVERTED TO AM STEREO RECEPTION USING MEDUCI AM_ST DECODER !! Mike G. from Hudsonville, Michigan successfully modified his Sony STR-DE525 receiver to hear WLS-AM (Chicago, Illinois USA) and WIRL-AM (Peoria, Illinois USA) in stereo at night! After this installation was completed, Mike says, "Well, Jeff I got her to work!!! You were right about the stereo indicator light only working during FM operation. So found out that where I tapped the power it was dropping the voltage to about three volts so the decoder wouldn't work. Tap it to the tuner power and works great now. I used 15k-ohm series resistors for audio and sounds great. ... I appreciate the product and help." Mike is procuring parts to assemble his own home-made large tunable loop antenna in order to improve reception further from distant AM stereo stations. Sean Cuthbert installed his meduci AM_ST decoder board inside the Sanyo M7850K AM/FM/SW/cassette boombox radio with very good results. He found that second hand AM stereo radios are very expensive, as sold on eBay. To save money, Sean decided to convert his own radio to AM stereo reception. He likes this Sanyo model, as it has two shortwave reception bands. In order to improve the recovered audio bandwidth, Sean also replaced the AM medium wave ceramic filter with a better device, capable of 10kHz audio response. This compares to the stock ceramic filter that allowed the AM radio portion to reproduce audio up to 4kHz (essentially telephone line quality)! Also, an integrated cassette recorder facilitates AM stereo airchecks to be saved. 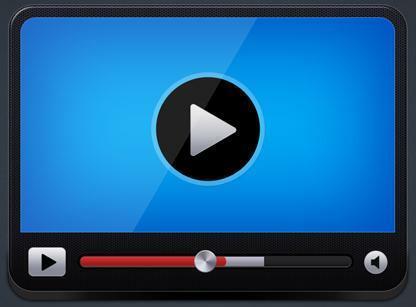 Play the video by clicking here>> AM stereo modification to Sanyo boombox. AM_ST DECODER WAS ADDED TO J.C. PENNEY MCS-3050 TUNER TO REDUCE AUDIO DISTORTION AND TO UPGRADE THE TUNER'S AM FIDELITY ! Neto Silva from Brazil installed his meduci AM_ST decoder into his J. C. Penney MCS-3050 tuner to improve the overall sound and to reduce audio distortion. Why would anyone add an AM stereo decoder to a tuner that already contains an AM stereo tuner? J.C Penney uses the Motorola first generation AM stereo decoder chip (MC13020P). In the third generation decoder chip (MC13028A) used in our AM_ST add-on board, a balanced full-wave envelope detector is used, which is technically better than the half-wave diode envelope detectors used in garden variety AM tuners and receivers. This design improves audio fidelity, due to the very low total harmonic distortion encountered (typically under one percent, and inaudible to the human ear)! There were six connections made from the AM_ST decoder board to the MCS-3050 tuner board. Of course, meduci provided complete and detailed installation instructions with AM_ST decoder purchase! If you have MCS-3050 tuner, you should consider upgrading the AM stereo functionality with one of our AM_ST models. 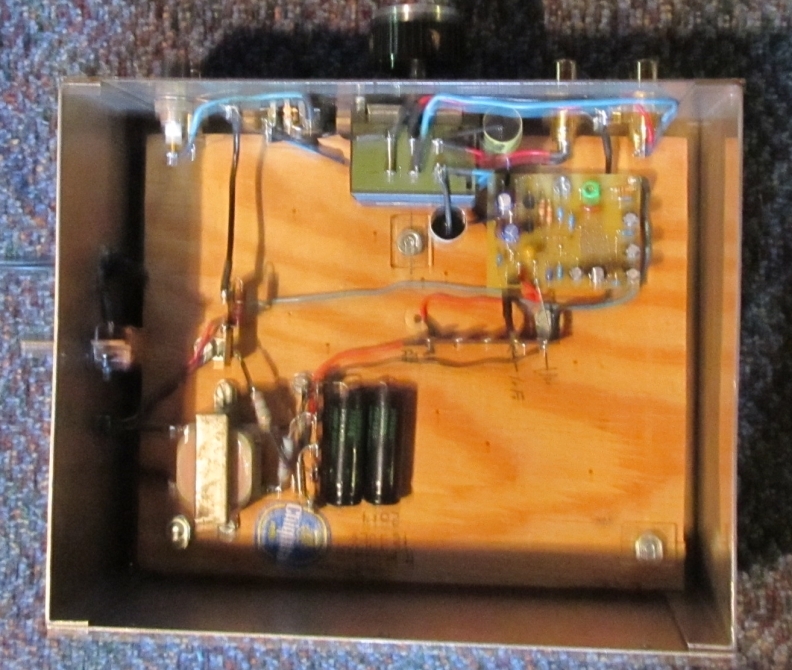 Rich Modafferi built his "connect to any radio" AM stereo decoder enclosure to house his meduci AM_ST decoder board, which complements his tube-based AM stereo C-QuAM transmitter. Rich also used his Sencore SG80 stereo generator for testing purposes. His enclosure has inputs for 455 kHz I.F and a level control is provided for adjusting this I.F input. There are both BNC and RCA I.F input jacks, and fixed and variable audio level outputs. Single indicator lamp functions for "power" and "stereo", glowing dim on power, and full bright for AM C-QuAM stereo lock. X-FM conducted C-QuAM stereo broadcast on July 23, 2012. 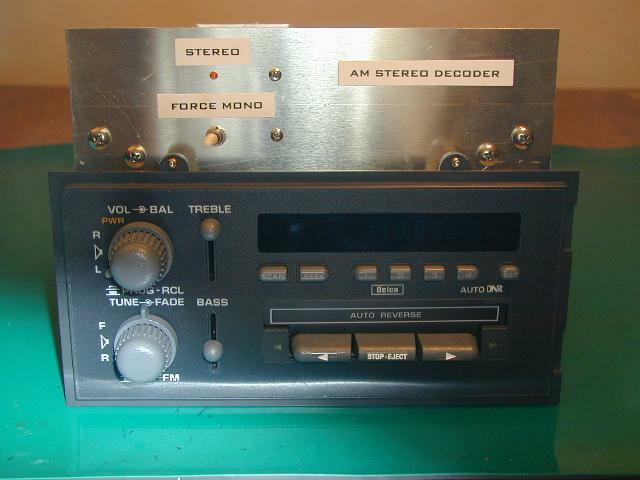 Kenwood TS-140S shortwave receiver was modified by JFarley for AM stereo reception using his AM_ST decoder. This modification allowed reception for this X-FM underground test broadcast from Redhat using C-QuAM stereo technology! This unique "music to the power of X" broadcast signed on just after 02:00 UTC with test tones at various frequencies, then X-FM identification as "C-QuAM AM stereo test transmission" followed by The Cars "Moving in Stereo" song. Indeed, this is an appropriate song for this test! You can listen to this stereo broadcast here>> meduci AM STEREO SHORTWAVE TEST (20.2MB). There is some fading evident during the 43-meter single sideband shortwave test transmission. As expected, lack of stereo lock occurred during the very deep fades. 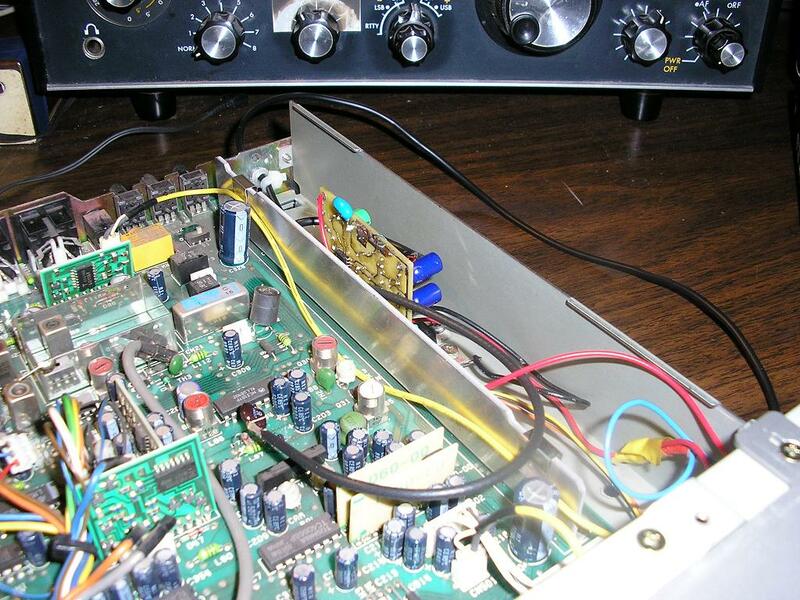 From JFarley: "With the hardware decoder on a TS-140S, I have pilot about 50 percent of the time. Thought there was separation during The Cars piece when you got above S9. Kind of eerie listening and just getting a feel for this. It's noisy tonight with choppy fades. The meduci decoder in the TS-140S seems to lose pilot easily in a fade. I am in and out of lock with fading, and it is sometimes a pronounced difference, sometimes it is more subtle. But it is stereo! Reception here was around S8-S9, and that would have been enough to keep pilot lock here, I feel. Problem was the very choppy fades down to S5. I also noted some unlocking due to noise." You do not need to search high and low for a Kenwood TS-140S shortwave receiver. 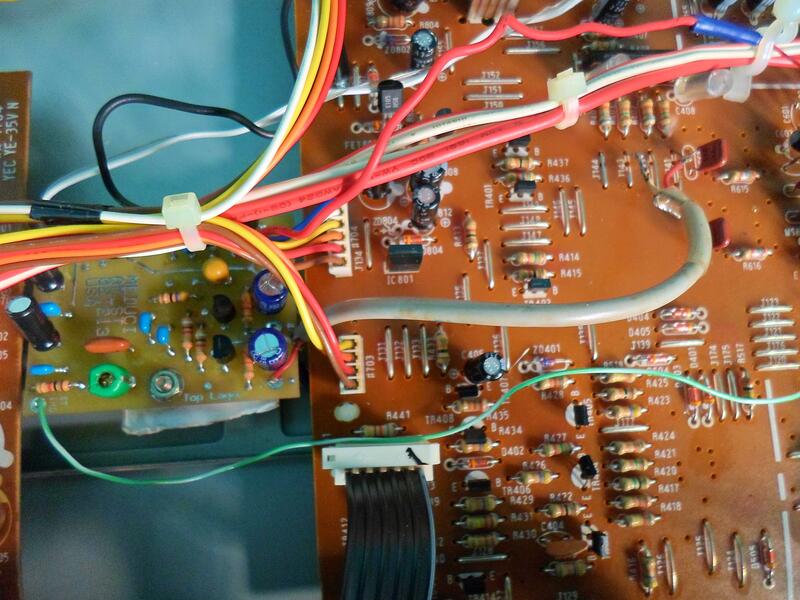 Our past customers have successfully combined Redsun RP2100 with our outboard AM_ST stereo C-QuAM decoder board with very good results. Redsun RP2100 is nearly identical to C.Crane CC Radio-SW model. 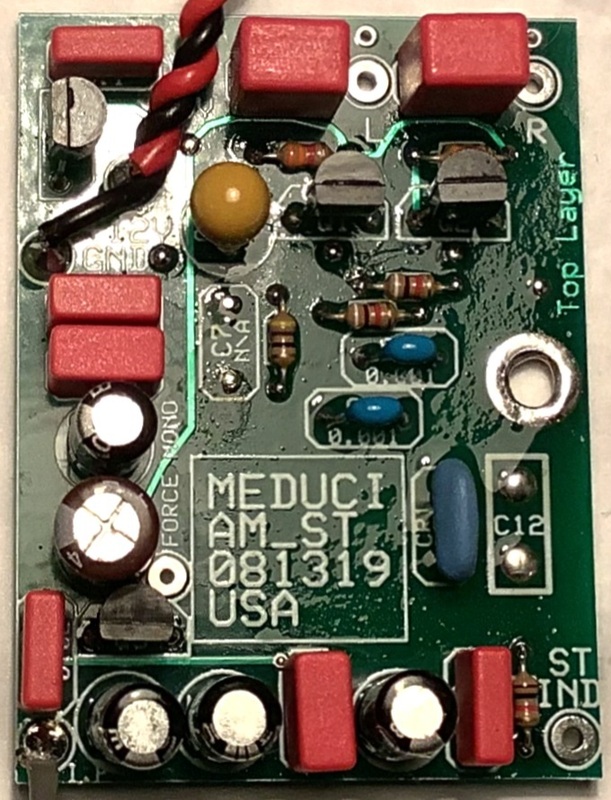 Both models tune the entire shortwave radio bands, and have the necessary 455kHz I.F output, so you do not need to open the radio, in order to install our AM_ST model C-QuAM decoder board. Todd Roberts (WD4NGG) converted his Delco automotive FM stereo/AM mono radio (model 16194955 - readily available on eBay) to AM stereo using his meduci outboard AM_ST decoder, so that he could hear "The Mighty 1630 KCJJ" in stereo. He also receives WLS from Chicago via skywave propagation! He added the forced mono switch to one of the mounting ears of the Delco radio! He placed the AM_ST board in a plastic box and added front-mounted AM Stereo indicator. Todd also replaced the stock 3kHz ceramic filter in the Delco radio with new 7.5kHz ceramic filter from eBay. 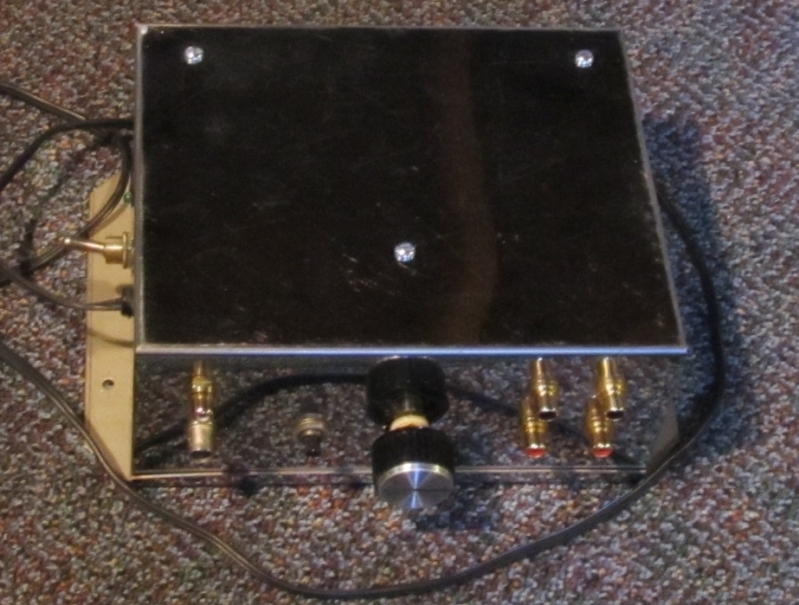 This was a simple modification, since the 450 kHz I.F level from the Delco is an ideal match to the AM_ST board! Since muRata 3.6MHz ceramic reonators are as scarce as hen's teeth these days, Todd used one 43uH toroid inductor resonated with a 9-50pFd ceramic trimmer in place of the stock ceramic resonator. With continued experimentation, Todd says, "One thing I noticed using the toroid with loose turns wound over the core was it seemed to be a bit microphonic if bumped, so the turns will need to be glued in place, and the toroid probably glued to the board, to make it rock solid. Of course there were no microphonics noticed when tapping the ceramic resonator." Todd's most recent summer project was to relocate his meduci AM_ST outboard decoder into a small aluminum shielded BUD box enclosure, which was mounted to an aluminum sub-panel, then bolted to the front mounting ears on the top of his Delco 16194955 AM Mono/FM Stereo automotive radio. 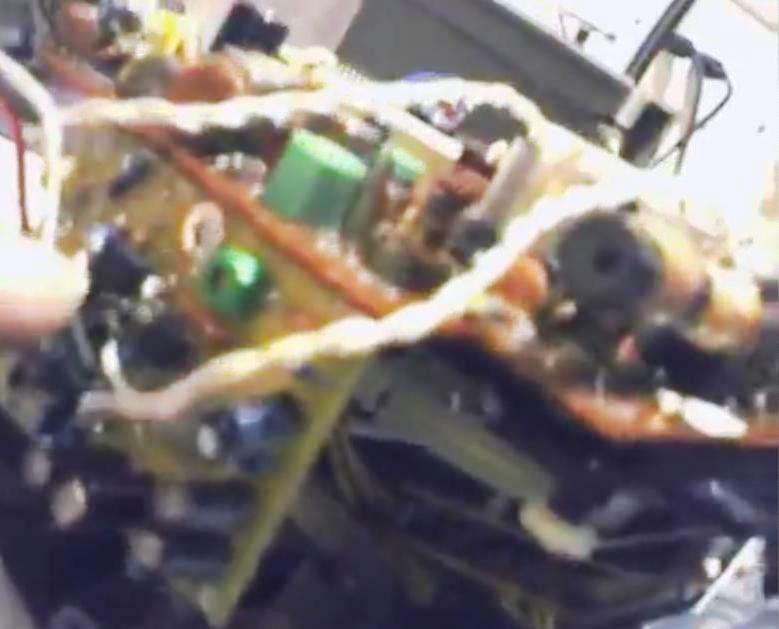 Todd's solution to interfacing the Delco's internal top tuning board to the outboard AM_ST decoder was to solder a printed circuit board-mounted SMA socket directly to the tuner board. 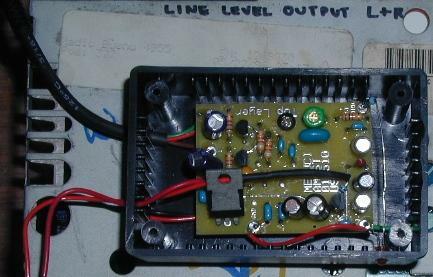 This socket was connected across the output pin from the 7.5kHz ceramic filter, and its ground pin, without having to drill any holes, or change anything on the tuner board. Todd was then able to route the I.F signal from the Delco radio to his AM_ST decoder board using a small SMA shielded jumper cable and SMA connectors. Todd did have to punch out one 0.5-inch hole in the top cover of the Delco radio, in order to allow the SMA socket to protude through the top cover. Modifications were not necessary to the Delco tuner board itself, though. Using a spectrum analyzer, Todd determined that using this very short length of small SMA shielded cable did not affect the I.F filter's passband or ripple. This re-packaged combination also eliminated the stray shortwave station interference that Todd had previously encountered, sometimes when listening at night, when using his AM_ST decoder mounted in an unshielded plastic box. Hopefully, these modifications provides inspiration for project creations using your own meduci AM_ST decoder board. 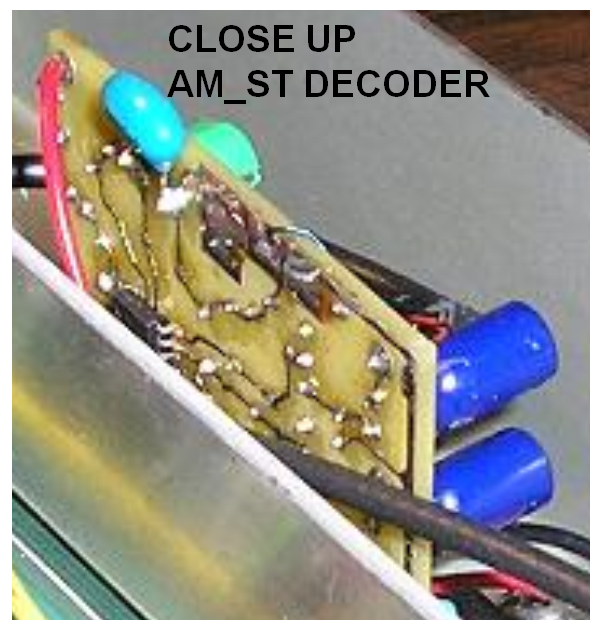 Please send us your AM stereo decoder conversion pictures, experiments, and descriptions using your AM_ST decoder! We will display the pictures and describe your project in an upcoming meduci web site update. Analog AM stereo technology has claimed its roots almost since the beginning of conventional monaural AM broadcasting within the United States. Later, four different competing AM stereo systems were placed on the air in the early 1980's, including systems from Motorola (C-QuAM™), Magnavox (PMX), Kahn-Hazeltine (ISB), and Harris Broadcast (Variable Angle Compatible Phase Multiplex, or V-CPM). Eventually in 1993, Motorola's C-QuAM technology achieved the exclusive standard for AM stereo broadcasting within the U.S.A. During this time period, Australia, Japan, and other countries were also exclusively using the Motorola C-QuAM system, making C-QuAM the essential de facto world standard for AM stereo broadcasting technology. All of the AM stereo systems share in common the addition of a stereo exciter to the existing monaural AM transmitter. This exciter typically has two outputs: the monaural L+R audio, which is time delayed and fed to the transmitter's normal audio input; the second output is the R.F carrier, which replaces the signal from the transmitter's normal quartz crystal oscillator stage. This signal also contains the necessary time delayed and phase modulated (quadrature) information. Because these stereo exciters are retrofitted onto transmitters which were never designed for AM stereo operation, they also must contain corrective equalizers and adjustable delay networks, to insure that all of the relationships are correct through the transmitter modulator, power amplifier, and ATU/antenna system. Decoded stereo separation suffers if the timing and phase relationships are not correct at the receiver. Motorola's C-QuAM system is covered in several U.S. patents written by the late Frank H. Hilbert and the late Norman W. Parker of Illinois. Norman Parker invented the C-QuAM system, per written correspondence from his wife, Margaret Parker. Margaret also wrote all of the patents. Patent number 4,218,586 was applicable to the basic system. Several other patents included 4,406,922 and 4,192,968. Delco Electronics Corporation (now known as Delphi) later introduced many adaptations and new C-QuAM inventions, covered under various additional U.S patents. meduci, LLC is a highly entrepreneurial and innovative organization that specializes in custom free-lance engineering, research, design, and production of electronic products in prototype quantities up to large scale manufacturing. We also design low frequency (class A, class AB, class D) audio power amplifiers, class C power R.F amplifiers, and R.F front-end (amplifier, mixer, oscillator), using National Semiconductor, Motorola, and other custom ASIC chipsets and discrete components. We strive for quality and excellence in workmanship. Our products are designed for faithful sonic reproduction of the on-air source material. For customers with specific requirements, you could always count on us to produce innovative solutions. Our customers are benefited by better pricing, quality warranty, and excellent technical support. Contact us for a free quotation -- we appreciate your business. Our goal is to meet the needs of our buyers, distributors and dealers, and we can work on an ad hoc basis. Please inquire for further details, and do not forget to mention "AM stereo" (without quotes) in the subject line. 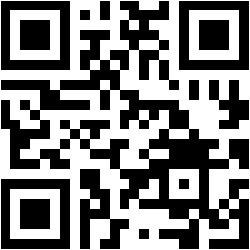 Write to amstereo'AT'meduci.com (replace 'AT' with the @ sign). This web page was updated on Sunday, April 21, 2019. Information listed herein is subject to change without notice. All rights and trademarks are the properties of their respective owners. © 2018 meduci LLC. All Rights Reserved.